Background Self-pressurized air-Q intubating laryngeal airway (air-Q SP) is a supraglottic airway device with a noninflatable cuff that does not need continuous monitoring of the cuff pressure. 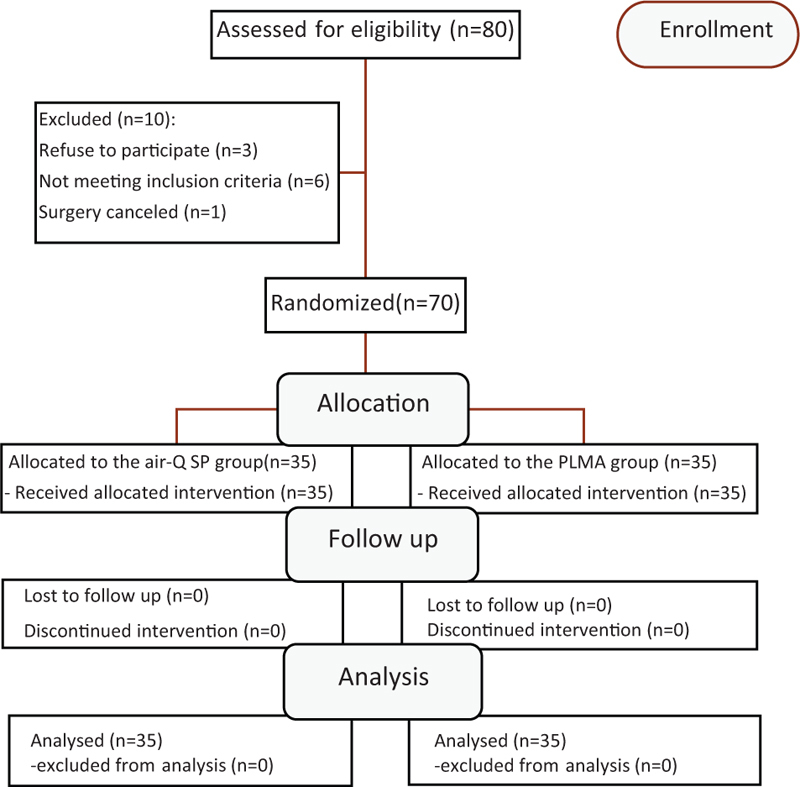 As the ProSeal laryngeal mask airway (PLMA) is considered the ‘state-of-the-art’ supraglottic device, we conducted this randomized trial to evaluate the safety and efficacy of air-Q SP compared with that of PLMA in pediatric patients. Patients and methods The study included 70 pediatric patients aged from 4 to 15 years undergoing elective surgery under general anesthesia who were randomized to either the air-Q SP group or the PLMA group. The primary outcome parameter in this study was the oropharyngeal leak pressure, and the secondary outcome parameters were ease of insertion, time of insertion, first attempt insertion success rate, number of gastric insufflations, fiberoptic glottic view, and complications related to the supraglottic airway device use. Results There was no significant difference between air-Q SP and PLMA regarding first insertion success rate, ease of insertion, oropharyngeal leak pressure, number of gastric insufflations, number of manipulations required to adjust the airway, and complications. Time to insert the air-Q SP was significantly shorter than that of PLMA (13.2±4.2 vs. 17.5±4.8 s, P=0.03). The fiberoptic view was significantly better with air-Q SP than with PLMA (P=0.018). Conclusion The performance of air-Q SP is comparable to that of PLMA as a primary airway device during general anesthesia in pediatric patients, with a shorter insertion time and better fiberoptic view for air-Q SP. Supraglottic airway devices (SADs) have been used increasingly in pediatric anesthesia. With the advancement in design and the availability of smaller sizes, SADs are now preferred by many pediatric anesthesiologists as a reliable and safe method to control the airway ,. The air-Q self-pressurized intubating laryngeal mask airway (air-Q SP) is a relatively new SAD that is similar in overall structure to the original air-Q, so it can be used as an efficient primary airway device for maintenance of anesthesia and also as a conduit for endotracheal intubation ,. The air-Q SP is different from the original air-Q in that it has no pilot balloon for cuff inflation and the presence of an inner aperture at the junction of the airway tube and the mask cuff allowing the communication between them which makes the cuff inflation to be self-regulated and the cuff pressure to be determined by the airway pressure so that it cannot exceed the peak airway pressure. These features of the air-Q SP should allow optimum airway seal at lower pressure levels, decreasing the risk for laryngopharyngeal complications and gastric insufflation seen with traditional SADs, which may be particularly beneficial in children who are more liable to complications following the use of SADs, owing to their unique airway structure, making issues about cuff overinflation still a concern for the pediatric anesthesiologists ,,,. The ProSeal laryngeal mask airway (PLMA) has been considered the safest and most reliable SAD in children with its superior ability for airway sealing even under high pressure, so any SAD used in pediatric patient should be compared with it regarding safety and efficacy ,,. To the best of our knowledge, air-Q SP has been studied in only two randomized controlled trials: one compared air-Q SP with the LMA Unique  and the other compared it with the i-gel . Therefore, we conducted this prospective randomized controlled study to compare the performance of air-Q SP with that of PLMA in pediatric patients under general anesthesia and controlled ventilation. Our hypothesis was that air-Q SP would be safer and more effective than PLMA in pediatric patient during maintenance of general anesthesia. The primary outcome of the present study was the oropharyngeal leak (OPL) pressure, and the secondary outcome parameters were ease of insertion, time of insertion, number of attempts to insert the device, incidence of gastric insufflation, fiberoptic laryngeal view, manipulations done to adjust the device position, and complications. The study was done in Zagazig University Hospitals over a period of 9 months from July 2015 to March 2016 after obtaining the approval of the ethical research committee of Zagazig University and written informed consent from the parents of each child. The study included 70 children aged from 4 to 15 years and weighing up to 50 kg, with an American Society of Anesthesiologist physical status 1 and 2, undergoing elective surgical procedures under general anesthesia, which was expected to last less than 2 h. Exclusion criteria were as follows: active respiratory infection (fever, cough, and rhinorrhea), BMI greater than 30 kg/m2, increased risk of aspiration, abnormalities in cervical spines, expected or previously known difficult airway, and refusal of the parents to participate in the trial. The children were randomized to either the air-Q SP group or the PLMA group using random number scheme created by a computer-generated randomization program. The random number was sealed in an opaque envelope which was opened just before induction of anesthesia, and according to the randomization, the selected device was prepared based on the child’s weight according to the manufacturer’s guidelines (air-Q SP: size 1.5 for 7–17 kg, size 2 for17–30 kg, and size 2.5 for 30–50 kg; Cookgas LLC, Mercury Medical, Clearwater, Florida, USA; PLMA: size 2 for 10–20 kg, size 2.5 for 20–30 kg, and size 3 for 30–50 kg). The parents were instructed to make the children stop food 6 h before surgery, whereas clear fluids were allowed till 2 h before surgery. The children were premedicated by intramuscular atropine 0.02 mg/kg 30 min before the surgery. When the child arrived to the operating theater, standard monitors in the form of pulse oximeter, five-lead ECG, noninvasive blood pressure, and capnography were used, and then a peripheral intravenous line was obtained. Anesthesia was induced by fentanyl 2 µg/kg followed by propofol 3 mg/kg. When the child lost consciousness, atracurium 0.5 mg/kg was administered, and then lung ventilation was continued manually for 3 min. Adequate anesthetic depth for SAD placement was confirmed by the absence of motor response to jaw thrust . The device was lubricated by a water-based jelly before placement. Both devices were inserted according to the manufacturer’s guidelines using the standard nonrotational midline approach for air-Q SP and the index finger digital method for PLMA by a single anesthesiologist who had previous experience in inserting PLMA and the original air-Q in more than 100 pediatric patients. The cuff of the PLMA was inflated with air according to the size (10 ml for size 2, 14 ml for size 2.5, and 20 ml for size 3). After confirming successful insertion of the SAD, it was secured by adhesive tape, and anesthesia was maintained by isoflurane 1–2% in 100% O2 and intermittent doses of 0.1 mg/kg atracurium to achieve muscle relaxation. Controlled ventilation was adjusted to maintain normocapnia (EtCO2 of 35–40 mmHg). Successful insertion of SAD was confirmed by square wave capnography, adequate chest movement, auscultation of bilateral air entry, and oxygen saturation greater than or equal to 95%. If the ventilation is considered inadequate, manipulation were done to adjust the device position in the form of pushing or pulling the device, head extension or flexion, and performing jaw thrust or chin lift, and the number of manipulations done were recorded. Failed insertion attempt was defined as an inability to insert the device or provide sufficient ventilation despite three airway manipulations . After three failed insertion attempts, the patient’s airway would be secured by an endotracheal tube, and the patient would be withdrawn from the study. Insertion time was counted from the moment the device was picked up by the anesthesiologist responsible for its insertion till the upstroke of first capnographic wave. The ease of insertion was assessed by subjective score consisting of four grades (1: no resistance, 2: mild resistance, 3: moderate resistance, and 4: inability to insert the device) . The anatomical relation of the device to the larynx was assessed by grading the laryngeal view using a fiberoptic bronchoscope (FB-8V 2.8 mm; Pentax Medical, Tokyo, Japan), which was placed in the airway tube to a position 1 cm proximal to its tip, and then the view was graded using a score from 1 to 4 (1: vocal cords not visible, 2: the epiglottis is only visible, 3: the arytenoid and partial part of vocal cord visible, and 4: whole vocal cord visible), where score 3 and 4 are considered as a good view of the larynx . OPL pressure was measured by closing the expiratory valve and setting the upper pressure limit to 30 cm H2O and the fresh gas flow to 3 l/min. The airway pressure was observed on the monitor of the anesthesia machine (Datex-Ohmeda S/5, GE Healthcare, Chicago, Illinois, USA), and the OPL pressure was recorded as the peak airway pressure at which audible leak (detected by auscultation of the anterior neck just lateral to the thyroid cartilage) occurred and equilibrium was reached on the pressure gauge of the machine . The OLP was measured after confirmation of successful insertion of the device and a second time after 10 min. The presence of gastric insufflation was detected by auscultating the epigastrium during OPL pressure measurement . Assessment of ease of insertion and grading of the laryngeal view was done by the anesthesiologist who inserted the air-Q SP and PLMA, but all the other measurements were done by an independent observer. At the end of surgery, anesthesia was discontinued, and atracurium was reversed by atropine 0.01 mg/kg and neostigmine 0.05 mg/kg and then the device was removed when the child is fully awake evidenced by spontaneous eye opening, facial grimacing, and signs of adequate motor activity such as reaching for the device and adequate respiratory pattern. Complications related to air-Q SP and PLMA were recorded during recovery, such as coughing, laryngospasm, airway obstruction, hypoxia (SpO2<92%), suspicion of regurgitation (presence of gastric fluid in the ventilation tube), blood staining on the removed device, and any lip, tongue, or dental trauma. Postoperative complications like sore throat, hoarseness of voice, and dysphagia were assessed by a blinded observer in the PACU and 24 h after the end of surgery by a ward visit or a telephone interview. Based on previous studies on SAD in pediatric patients that reported the OPL pressure of air-Q SP and PLMA to be 20±4.4 and 23.27±6.57 cm H2O ,, a sample size of at least 32 patients in each group was needed to detect a 10% difference in the OPL pressure between the two groups with a power of calculation 80% and type I error of 5%. Statistical analyses of data were done using the software SPPSS version 18 (SPSS Inc., Chicago, Illinois, USA). Continuous data were expressed as mean±SD and analyzed using Student’s t-test. Categorical and nominal data were expressed as number and percentage and were analyzed using χ2 or Fisher’s exact test. P value of less than 0.05 was considered statistically significant for all tests. A total of 80 patients were assessed for study eligibility; six patients did not meet the inclusion criteria, the parents of three patients refused to participate, and one case was canceled. Therefore, 70 patients were included and completed the study ([Figure 1]). Figure 1 Consort flow diagram illustrating the enrollment data. PLMA, ProSeal laryngeal mask airway. The results of the present study showed no significant difference regarding patient’s characteristics, type of surgery, duration of surgery, or duration of anesthesia ([Table 1]). The insertion characteristics of both devices are shown in [Table 2]. Both devices were inserted in all patients successfully with a first insertion success rate of 94.2% for air-Q SP and 91.4% for PLMA. Insertion time was significantly shorter for the air-QSP than for the PLMA (P<0.05). There was no significant difference regarding the ease of insertion or the number of manipulations required to adjust the device position between the air-QSP and the PLMA. There was no significant difference in OPL pressure between the two devices either initially or after 10 min. Gastric insufflations were also comparable between both devices (P>0.05). Fiberoptic laryngeal view was significantly better through the air-QSP than through the PLMA (comparing patients who had scores 3 and 4 to patients who had scores 1 and 2) as shown in [Table 3]. There were four (11.4%) cases of complications in the air-Q SP group and six (17.1%) cases of complications in the PLMA group without significant statistical difference between the two groups (P>0.05) ([Table 4]). All cases of laryngospasm and hypoxia were rapidly managed by oxygenation and gentle manual ventilation. The results of the present study showed that air-Q SP had significantly shorter insertion time and better fiberoptic laryngeal view than PLMA, whereas the success of insertion at first attempt, ease of insertion, OPL pressure, number of gastric insufflations, and complications were comparable between both devices. First insertion attempt success rate for air-QSP and PLMA in our study was 94.2 and 91.4%, respectively, and this was consistent with the results of two previous studies on air-QSP , and many studies comparing PLMA with other SADs ,,,. However, Kim et al. reported a higher first insertion success rate of 100% for the air-QSP compared with the i-gel, but they studied a different pediatric age group (aged from 1 to 108 months). A SAD that takes shorter time to insert may be more feasible in pediatric patients who tend to have rapid oxygen desaturation after a short period of apnea . The time to insert the air-QSP in this study was significantly faster than that of PLMA (13.2±4.2 vs. 17.5±4.8 s), which may be because of elimination of cuff inflation with the air-QSP, and the insertion time for both devices was close to that reported by previous studies ,,,. There was no significant statistical difference regarding the ease of insertion of air-QSP and PLMA in the present study, although the previous studies comparing air-QSP and the original air-Q with other SADs reported that the ease of insertion of air-Q was significantly lower than the other devices; however, none of these studies compared the air-Q with PLMA ,,,. Whyte et al. in a study done on original air-Q intubating laryngeal airway reported that the air-Q appeared to be similar to PLMA regarding the ease of insertion. Jagannathan et al. suggested the more flexible airway tube of air-Q SP as a possible factor that can affect its ease of insertion compared with LMA unique. A study done by Kim et al. comparing air-Q SP with i gel, reported that the mild resistance which might be faced during air-Q SP insertion was clinically insignificant as the device could be inserted rapidly, with a high success rate by an experienced anesthesiologist. OPL pressure is the airway pressure at which air leak occurs around the SAD, which may escape into the mouth or enter the stomach . OPL pressure is considered the most important factor to determine the safety and efficacy of SADs, as higher pressure indicates that the device can provide airway protection and allow adequate positive pressure ventilation ,. The OPL pressure of air-Q SP in our study was comparable to the results of the previous studies on both the original air-Q and the air-Q SP in pediatric patients ,,,,,; however, it was lower than that reported in adults ,. The present study showed no significant difference in OPL pressure between air-Q SP and PLMA either initially or after 10 min, although it showed more increase with air-Q SP after 10 min. The increase in the OPL pressure of air-Q SP after 10 min from the initial assessment was suggested by Jagannathan et al. to be owing to molding of the device to the posterior pharynx with better alignment of the ventilating orifice to the laryngeal inlet, which improves the sealing function. Fiberoptic laryngeal view is used to evaluate the anatomical alignment of the SAD in relation to the larynx ,. Poor fiberoptic view does not necessarily indicate obstructed airway, but down-folded epiglottis may increase airway resistance making positive pressure ventilation less effective especially with small SADs ,,. A good fiberoptic view is very useful when using the SAD as a conduit for tracheal tube in difficult intubation situations ,. In our study, air-Q SP had significantly better fiberoptic view than PLMA. Many previous studies examining the original air-Q and air-Q SP reported a better fiberoptic view when air-Q is compared with first-generation SADs ,,, and second-generation SADs ,,,,. The unique features that may explain the better fiberoptic view with air-Q than other SADs include the keyhole-shaped ventilating orifice for resting the epiglottis and also the raised heel of the mask cuff, resulting in better view of the laryngeal inlet ,.The results of the present study showed no significant difference in complications between the air-Q SP and PLMA with an overall complication of 11.4% for air-Q SP and 17.1% for PLMA. Previous studies on SADs reported an overall complication rate between 9 and 18% ,. The observational study done by Jagannathan et al. on air-Q SP reported a complication rate of 14%; most of them were airway related and not due to mucosal trauma. In another study done by Jagannathan et al. comparing the air-Q SP with LMA unique, no complications owing to mucosal trauma with air-Q SP were reported. In our study, there was only one case of complication related to mucosal trauma (blood staining on the device) with the air-Q SP. The low rate of mucosal trauma reported with air-Q SP may be because of the soft PVC material of the cuff and airway tube in addition to decreasing the risk of cuff overinflation and the pressure exerted on the pharyngeal wall potentially minimizing airway morbidities which is of particular importance in pediatric patients where mucosal perfusion pressure is lower than that of adults ,. The limitations of our study included the following: the study included only patients with normal airway and did not evaluate the air-Q SP as a conduit for tracheal intubation, the data collection was done by a nonblinded observer, and the device insertion was done by an operator who had more experience in PLMA than air-Q SP. However, the last two limitations were probably unavoidable. 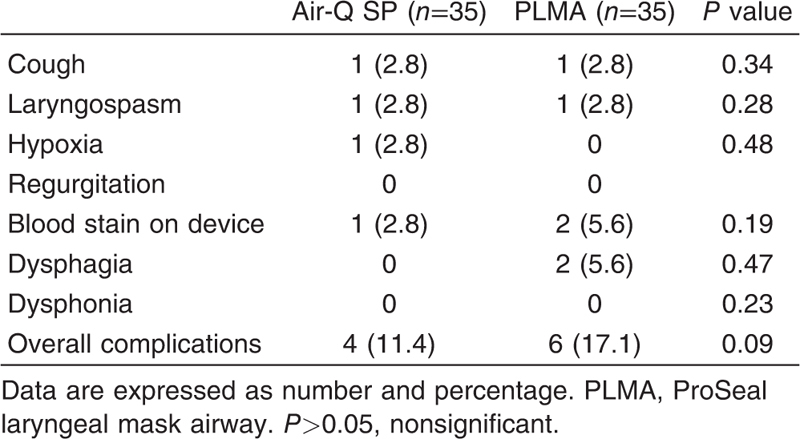 From the results of the present study, we concluded that air-Q SP is faster to insert than PLMA and has better fiberoptic view; otherwise, other insertion characteristics, sealing functions, and complications are comparable between the two devices, so air-Q SP may be used safely and effectively as a primary airway device in pediatric patients especially when routine monitoring of cuff pressure is not used. Goyal R. Small is the new big: an overview of newer supraglottic airways for children. J Anaesthesiol Clin Pharmacol 2015; 31:440–449. Darlog V, Biyani G, Pandey R, Baidya DK, Chandralekha, Punj J. Comparison of the performance and efficacy of air-Q intubating laryngeal airway and flexible laryngeal mask airway in anesthetized and paralyzed infants and children. Pediatr Anesth 2014; 24:1066–1071. Galgon RE, Schoeder KM, Hans S, Andrei A, Joffe AM. The air-Q intubating laryngeal airway vs the LMA: Proseal™: a prospective randomized trial of airway seal pressure. Anaesthesia 2011; 66:1093–1100. Cook TM, Lee G, Nolan JP. The Proseal™ laryngeal mask airway – a review of literature. Can J Anaesth 2005; 57:128–132. White MC, Cook TM, Stoddart PA. Critique of elective pediatric supraglottic airway devices. Pediatric Anesth 2009; 19:55–65. Jagannathan N, Sohan LE, Sawardekar A, Shah R, Ryan R, Jagannathan R, Anderson K. A randomized comparison of self-pressurized air-Q™ intubating laryngeal airway with the LMA Unique™ in children. Anaesthesia 2012; 67:973–979. Maitra S, Baidya DK, Bhattacharjee S, Khanna P. Evaluation of the i-gel™ airway in children: a meta-analysis. Pediatr Anesth 2014; 24:1072–1079. Kim MS, Lee JH, Han SH, Im YJ, Kang HJ. A randomized comparison of i-gel™ with self- pressurized air-Q™ intubating laryngeal airway in children. Pediatr Anesth 2015; 25:405–412. Drage MP, Nunez J, Vaughan RS, Asai A. Jaw thrusting as a clinical test to assess the adequate depth of anesthesia for insertion of the laryngeal mask. Anaesthesia 2001; 11:319–321. Fukuhara A, Okutani R, Oda Y. A randomized comparison of the i-gel and the Proseal laryngeal mask airway in pediatric patients: performance and fiberoptic findings. J Anesth 2013; 27:1–6. Kim MS, Oh JT, Min JY, Lee KH, Lee JR. A randomized comparison of the i-gel and the Laryngeal Mask Airway Classic in infants. Anaesthesia 2014; 69:262–267. Brimacombe J, Berry A. A proposed fiberoptic scoring system to standerdize the assessment of the laryngeal mask airway position. Anesth Analg 1993; 76:457. Lopez GM, Brimacombe J, Keller CA. Comparison of four methods for assessing oropharyngeal leak pressure with the laryngeal mask airway (LMA) in pediatric patients. Pediatr Anesth 2001; 11:319–321. Whyte SD, Cooke E, Malherbe S. Usability and performance characteristics of the pediatric air-Q intubating laryngeal airway. Can J Anaesth 2013; 60:557–563. Saran S, Mishra SK, Badhe AS, Vasudevan A, Elakkumanan LB, Mishra G. Comparison of i-gel supraglottic airway and LMA-ProSeal™ in pediatric patients under controlled ventilation. J Anaesthiol Clin Pharmacol 2014; 30:195–198. Jagannathan N, Sohn LE, Mankoo R, Langen KE, Roth AG, Hall SC. Prospective evaluation of the self-pressurizd air-Q intubating laryngeal airway in children. Pediatr Anesth 2011; 21:673–680. Goyal R, Shukla RN, Kumar G. Comparison of the size 2 i-gel supraglottic airway with the LMA ProSeal and LMA Classic in spontaneously breathing children undergoing elective surgery. Pediatr Anesth 2012; 22:355–359. Shimbori H, Ono K, Miwa T, Morimura N, Nogushi M, Hiroki K. Comparison of the LMA-ProSeal and LMA-classic in children. Br J Anaesth 2004; 93:528–531. Lardner DR, Cox RG, Ewen A, Dickinson D. Comparison of the laryngeal mask airway (LMA) proseal and the LMA-classic in ventilated children receiving neuromuscular blockade. Can J Anaesth 2008; 55:29–35. Jagannathan N, Sohn LE, Mankoo R, Langen KE, Mandler T. A randomized crossover comparison between the laryngeal mask airway-unique and the air-Q intubating laryngeal airway in children. Pediatr Anaesth 2012; 22:161–167. Kleine-Brueggeney M, Nicolet A, Nabecker S, Seiler S, Stucki F, Greif R, Theiler L. Blind intubation of anaesthetised children with supraglottic airway devices AmbuAura-i and Air-Q cannot be recommended: a randomised controlled trial. Europ J Anaesth 2015; 32:631–639. Hughes C, Place K, Berg S, Mason D. A clinical evaluation of the i-gel superaglottic airway device in children. Pediatr Anesth 2012; 22:765–771. Darlong V, Biyani G, Baidya DK et al. Comparison of air-Q and Ambu Aura-i for controlled ventilation in infants: a randomized controlled trial. Paediat Anesth 2015; 25:795–800. Bakker EJ, Valkenburg M, Galvin EM. Pilot study of the air-Q intubating laryngeal airway in clinical use. Anaeth Intens Care 2010; 38:346–348. Inagawa G, Okuda K, Miwa T et al. Higher airway seal does not imply adequate positioning of laryngeal mask airway in pediatric patients. Pediatr Anesth 2002; 12:322–326. Park C, Bahk JH, Ahn WS et al. The laryngeal mask airway in infants and children. Can J Anaesth 2001; 48:413–417. Weiss M, Engelhardt T. Proposal for the management of the unexpected difficult pediatric airway. Pediatr Anesth 2010; 20:454–464. Girgis K, Youssef M, Elzayyat N. Comparison of the air-Q intubating laryngeal airway and the cobra perilaryngeal airway as conduits for fiber optic-guided intubation in pediatric patients. Saudi J Anaesth 2014; 8:470–476. Jagannathan N, Sohn LE, Sawardekar A et al. A randomized trial comparing the Ambu® Aura-i™ with the air-Q™ intubating laryngeal airway as conduits for tracheal intubation in children. Paediatr Anaesth 2012; 22:1197–1204. Jagannathan N, Sohn L, Ramsey M et al. A randomized comparison between the i-gel™ and the air-Q™ supraglottic airways when used by anesthesiology trainees as conduits for tracheal intubation in children. Can J Anesth 2015; 62:587–594. Lopez-Gil M, Brimacombe J, Alvarez M. Safety and efficacy of the laryngeal mask airway. A prospective survey of 1400 children. Anaesthesia 1996; 51:969–972. Maino P, Dullenkopf A, Keller C et al. Cuff filling volumes and pressures in pediatric laryngeal mask airways. Pediatr Anesth 2006; 16:25–30. Wong JG, Heaney M, Chambers NA et al. Impact of the laryngeal mask airway cuff pressures on the incidence of sore throat in children. Pediatr Anesth 2009; 19:464–469.